short rayon chainette fringe cascading from a perfectly shaped brocade or floral print triangle, with shaping darts and front ties for a secure and elegant fit. Great for practice, for layering over a long fringe belt ( for two layers of fringe and interesting color combos), and for layering under coin and tassel belts. 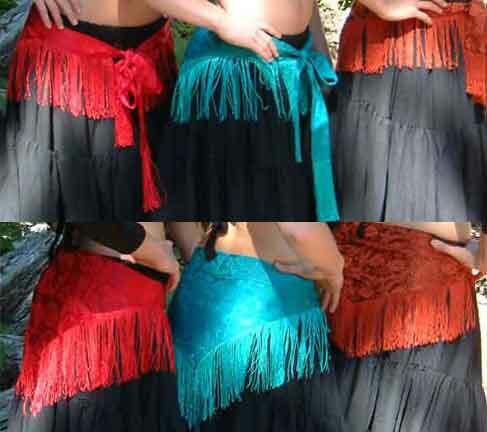 Belt fits hips 2-10 inches wider than fringe to fringe measurement- order smaller if you want a wide gap in front- larger if you wish fringe to overlap. These belts are hand crafted after I receive your order.